MainAll NewsDefense/SecurityHow do Bedouin become radical Islamists? How do Bedouin become radical Islamists? Dr. Mordechai Kedar, expert on Israeli Arabs, says Bedouin who now feel marginalized in Israeli society are attracted to extremist Islam. Police reported that the terrorist who murdered a policeman Wednesday morning in Umm Al-Hiran was a member of the Southern section of the Islamic movement and also had associations with ISIS. Arutz Sheva asked Dr. Mordechai Kedar, an expert on Israeli Arabs who lectures at Bar-Ilan university, whether terrorist organizations find a base for their activity within the Bedouin community. Kedar replied that "this is not new. The Islamic movement, both in the Northern and Southern branches is very active within the Bedouin community. The Northern branch, which has been made illegal, used to make mass constructions of buildings over one day with thousands of volunteers in flagrant violation of the law. However the Southern branch is represented in the Knesset and is deemed legal." Kedar added that he doubted that the terrorist was associated with ISIS as that would be a criminal offence. "Why wasn't he sitting in jail and why hadn't an indictment been issued against him? To say this after his death is strange. I'm not saying that he wasn't connected, but if they knew about it why was he walking around free?" 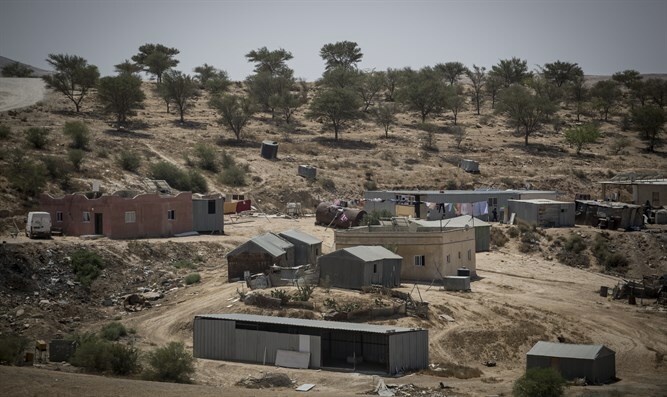 Does the Bedouin community serve as fertile ground for extremist Islamic groups in general? Kedar added that although they were once a strict society, "there has been a moral decline among Bedouins who are rebelling against their parents. There are troubling social issues there causing youth to want to connect to something which appears good, ok, serious and honest and the Islamic movement has made great headway with these youth. This is why we see many mosques in the Negev, even though originally Bedouins had a very soft version of Islam. They knew the prayers and Islamic sources a little but had a weaker connection to traditions, and the Islamic movement has entered the moral vacuum as a social and political alternative for a community which finds itself marginalized." Is the Islamic movement truly just and idealistic or does it just portray itself as such? During the eighties when it began its activities it consisted of young idealists who did not get involved in financial activities and therefore it grew meteorically.However thirty years on, every movement becomes more tainted and the same ideological youths of thirty years ago have turned into sixty year old family men with pensions, salaries and financial interests. "Many people see these movements as having undergone a process of corruption and therefore there are new initiatives in Islamic politics stemming from the fact that the older movements are in regression. For this reason there were few demonstrations when the Northern branch was outlawed, as public support for the movement is negligible. Arab society was even relieved when [head of northern branch of Islamic movement] Raad Salah was jailed as when he is in jail he cannot harm others." What is the main difference between the Northern and Southern branches of the movement? "Both the Southern and Northern branches of the movement aim to build an Islamic state on the ruins of the state of Israel, but the question is what they are doing towards this goal. If you just pray and it remains a dream we can live with this as long as they are not taking any practical steps. However the Northern branch buttressed its ideology with actions, gathering money for Hamas and organizing other activities to agitate and incite the masses. This caused them to be outlawed." Kedar says that as the older movements become less active and more politicized, new extremist movements are cropping up with disenchanted youth taking the place of the older generation of radicals. He adds that this phenomenon is happening all over the world in every organization and ideology and not just in Israel.